The first summer I lived on my ranchito, the summer of 2004, I hired Cody Scott to plant native grass seeds in my far pasture, the Pecan Tree Pasture that lay between Barton Creek and Salt Creek. Last summer I reseeded the pasture with native grass seeds and wildflowers. The upshot of these two distributions has been a resurgence of bluestem, side-oats gramma, buffalo grass, coneflowers, Indian blankets and vetch. Frankly, I held no longitudinal goal other than to provide habitat food for cattle, horses and wildlife. Frank Waters of The Man Who Killed The Deer (1942) fame wrote that the proper relationship of a person to the land was to “live with the land,” not on it, but with the land. Living with the land has been an axiom for me, a mantra for many years. A U.S. Department of Agriculture Farmers’ Bulletin No. 2035, “Making Land Produce Useful Wildlife,” provides me guidelines to live with the land. By way of full disclosure, I do not make my living raising cattle or horses, but teaching at a junior college in Abilene, so my basic approach to my ranchito is sustaining the land, not cropping, leasing or planting. That being said, I integrate what I have learned with horses, cattle and the land into my lectures. The land is my teacher and all things upon it instruct, from thistles under juniper to even — I hesitate to write this — the mesquite. So, a few tips from “Making Land Produce Useful Wildlife,” by Wallace L. Anderson, biologist, Soil Conservation Service, I list below. To support a high wildlife population, a farm or ranch must have a plentiful supply of good food close to cover that furnishes protection from enemies and weather. And it must be available in all seasons of the year…. Pastureland practices harmful to wildlife are uncontrolled burning, overgrazing, and complete clean mowing early in the season…. There are three essentials to good cover for wildlife — grasses, weeds, stubble, and other low-growing plants for nesting and roosting; dense or thorny shrubs for protection from predators, for loafing, and for nesting; and, in the North, clumps of evergreens or other tall dense cover for winter protection. Mesquite thorns, poisonous plants and cacti also abound along the fence rows in the far field. I have bull nettle, a stinging plant to the touch, but it has medicinal properties. The nightshade plant that many define as a weed has been used to treat snakebite erupts along the corral. And the few cedar trees, cut and harvested year after year prior to my ownership, their posts for sale in Mingus and Palo Pinto, are defined more appropriately as “juniper” provide berries for birds, aroma for incense and luscious shade from the sun. I shan’t be cutting cedar breaks or juniper. All this in the far field allows the flourishing of wildlife close to me, close to you, close to us all. Juniper, often referred to as cedar (J. Matthews, 2011). In the country, dust and heat on summer solstice day in Texas compress the air and stifle activity unless pickup doors close and air conditioning is set to near maximum. Cattle bunch up under the shade of mesquite and live oak, chewing cud, panting and resting. Highway construction workers — I see them between Mingus and Abilene — don white, flowing bandannas about their neck, issuing profiles of Bedouin upon the Arabian desert. The workers move slowly, crumbling with drills and backhoes the old asphalt so that concrete may be laid for continental traffic. They toil for dollars, but mostly for future mirages in far-off lands. So dry, the forest service retorts, that in the recorded weather history of Texas, no drier period between last October and May has occurred. As the sun set two days ago, smoke from wildfires westward turned the sun blood-red and I thought of all the science fiction tales that speak of dying worlds, collapsing stars and barren wastes of uninhabitable planets. But yesterday evening, thunder and lightening came through the ranchito with rain that pooled ever so briefly on the county road, setting new potholes that I will not regret. The sky, the air turned yellow, yellowish-green, and in the east where the squall line flew, the darkest blue set the mantlepiece for a rainbow, two of them, in the sky. How infinite the patterns of the weather for one day the sun scorches the veld and the next day reflects the colors of rainbows. Flame and rainbow melt. The colors drape beautifully, artfully, upon a landscape that nourishes life and hope again, an elegant form that rests against me. Dust and heat will come again, I know. But yesterday a rainbow colored my sky and will again. Arizona in Extremis | Find an Outlet. My fellow blogger, Debra, out in Arizona is posting on the wildfires near her town of Bisbee. This posting illustrates the problems of evacuation and caring for pets as well as the terrible destruction close-by her residence. She has other postings about the wildfires. There’s so much controversy over ignitions, forest management and evacuation that can be debated after the fires are put out. Debra has spent major intervals of her life taking care of animals. She and her husband moved to Bisbee several years ago from New England. She is attempting to help her friend, Janice, who has many dogs and is worried about evacuation and her pets. What is this with horses and water? Hoof prints in water from Barton Creek. Star's hooves covered in mud so much you can't see his shoes. He's really a good boy. Water, mud and a horse. Star after playing in water is curious about camera and all the excitement. What is this with horses and water? Or for that matter, kids and water? They love playing in water. I’ve not had rain in a few weeks and the corral is dry. Star’s hooves needed moisturizing, so I turned on the water sprinkler this morning to partially flood the corral — about thirty minutes of watering. Star saw the water coming out of the sprinkler and shoved his head, nose and mouth down into the steam of water, pawed at the ground and for forty-five minutes stood over the sprinkler getting his front quarters wet and soggy as well as his hooves. I finally left him there, went back up to the house for another cup of coffee and to fetch the camera. When I returned, he had gone back to his hay bin, but returned to the sprinkler when I asked him to pose. He posed for a pretty-good head shot. I am down to one horse, Star, and no cattle — for the moment. I sold three horses in January and Lilly had to be put down that same month. The far Pecan Tree Pasture is ready for a few head of cattle to graze and Star and I need to be around bovine for awhile. Star has a natural cutting ability and takes his cue from me, even when I am on foot and not in the saddle. If he sees I am trying to pen cattle, he will help me round-up the cattle and put them in the pen — more shepherd than equine I sometimes think. Early morning scan for fresh grass through corral panels. Post-publication note: If you have not clicked on the first link of Sage to Meadow Photostream, the picture with the elk in the water, do so. It is a young elk playing in the water and is enchanting to watch. The Photostream is on the first sidebar — NOT the Vodpod photos of guitarists. Mustang grape vines on southern fence of Pecan Tree Pasture (May 2011). Emergent flora signifies the arrival and maturation of Spring into Summer in central Texas. Mustang grape vines climb trees and follow fence lines without fail. I collect buckets of ripened grapes in late June or early July. Daily observations of ripening grapes must take place or birds pluck the deep ruby-red berries and in over-consuming they fly dizzily, drunkenly away, first to the harvest, leaving my mouth and bucket empty. Mesquite and mustang grapevines often intertwine and when harvesting, the mesquite thorns force the cost of harvesting painfully upward. Mustang grapes with mesquite (June 2011). When rain falls, grass flourishes. The top of the stems reach six-feet or more high. Big. Native. Bluestem. The final exhibit of Spring in this post is prickly-pear cactus with its brilliant yellow cactus flower. I note that many varieties of insects clamor and dive into the flower, bees especially. Cactus is destroyed as nuisance flora as a regular chore on small ranches and farms. Yet, its fruit is edible, the flower yields pollen for honey and in drought, propane torches burn thorns and cattle consume the paddles. The roar of burning pear signals drought upon the land. The Spring to Summer in central and west Texas is endurable as we live with the land whether mustang grapes emerge or prairie fires burn. Barton Water Co-op provides this water. Thistles, horsemint and nightshade on embankment (June 2011). The star of nightshade (June 2011). Emily Dickinson upon thistle (June 2011). Bees collect pollen upon the thistle. A few grasshoppers look on, ready to fly when I wade into the grass. The embankment stands to the northwest of the cow tank or pond. 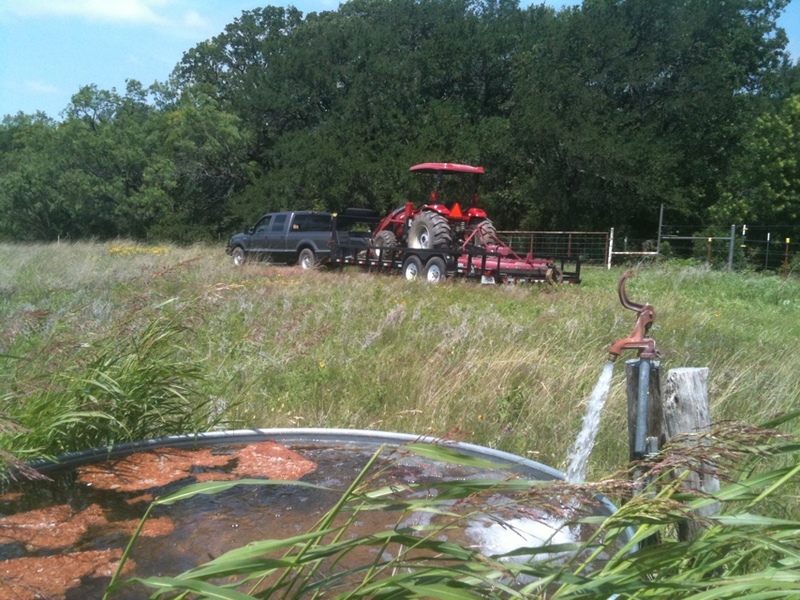 I have a predilection to call these runoff water ponds, “cow tanks,” from my background in San Saba, Texas. I remember a cow tank I once swam in with my cousins. We swam and got our feet muddy at the edges of the cow tank on the Hollingshead place near Mullin, Texas. When the land was subdivided after my step-grandfather’s death, my step-father made sure that the surveyors included the cow tank within his parcel of 35 acres. My cousins and I now own the 35 acres and this summer I plan to swim in the cow tank, its waters pure from pasture and rocky cliff runoff.